Slowly but surely, I’m flipping through the pages of the books I’ve hoarded and neglected and will be giving mini-reviews on what I think of them in the new segment Shelf Life Expiration Reviews. Last month, I took to task reading the philosophical narrative Sophie’s World: A Novel About the History of Philosophy by Jostein Gaarder. What a powerful read. I’ve had a mild fascination with the history of major philosophies for quite some time, having read a little here and there throughout my hefty academic career. However, I had been having a hard time figuring out where to properly begin my sojourn into the world of philosophy – something more put together than a series of Wikipedia articles, but that would take less effort than reading translations of interpretations of translations of old texts? Sophie’s World was my answer. Gaardner opens us into the cradle of western thought in Greece and guides us through the cliched whirlwind tour of the history of western philosophy. At first, the metanarrative seemed like a cheap, lazy veil of a story to carry the history lesson through. But it ended up taking a brain-picking turn for the unexpected. Socrates, the Renaissance, Hume, Hegel, Darwin. It’s by no means an exhaustive look at the history of western philosophy – he gives Nietzche a mere sentence of a mention – but it’s great for newbies like me. And the index at the back makes for easy referencing. I still don’t understand all of what happens narratively in the novel with Gaarder toying with questions of perspective and reality, so I suppose I’ll just have to read it again sometime. Not complaining here. 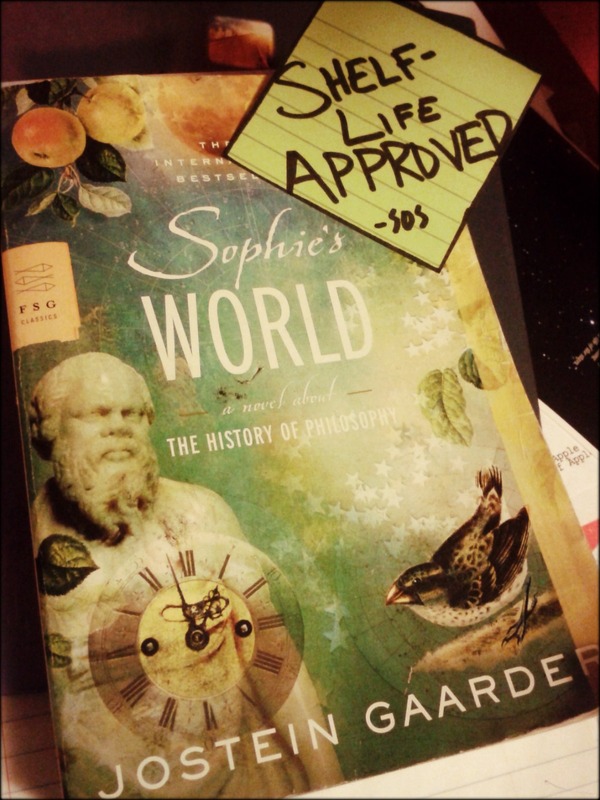 Sophie’s World gets the Shelf Life Seal of Approval from me. This is the first Shelf Life Expiration Review of hopefully many more to come. I’ll try my best to read a non-school-related book each month from my Shelf Life Expiration List and tell you how great, mediocre, or terrible I think it is. Have you read Sophie’s World? Or any book like it? Feel free to share your opinions in the comments below.